Grandpa might die! How to save grandpa from cannibalism? You don't need guns or army training to save Grandpa. You just need to learn how to punctuate correctly. separates items in a series. EX: Mary loves the colors red, blue, and green. 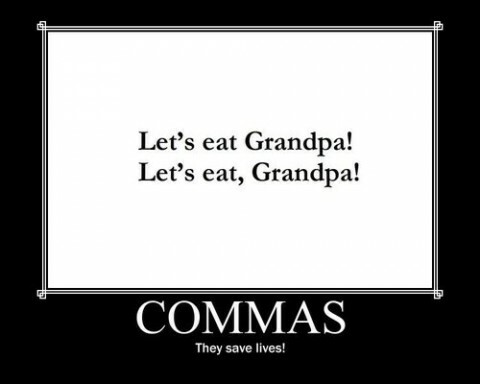 Note that the comma goes before the final "and." Diana Hacker (author of the bestselling and lifesaving A Writer's Reference series) also discusses this in her fantastic books. separates two independent clauses when used with a conjunction (one of the FANBOYS - For, And, Nor, But, Or, Yet, So). EX: I hate movies, but I love plays. The first independent clause is I hate movies. The second independent clause is I love plays. They are connected by a comma and a FANBOYS (coordinating conjunction). EX: After Anne went for a walk, she made dinner. The dependent clause is After Anne went for a walk. The independent clause is she made dinner.